Welcome to Salento Yoga! Salento Yoga offers you a sanctuary from the outside world. Give yourself the gift of some well-deserved time to nourish your body, calm your senses, relax your mind and awaken your spirit. Spend your days indulging in blissful yoga classes, fresh home cooked Italian food, treat yourself to a massage, read a book or take an afternoon nap, hire a bicycle or car and explore the stunning surroundings and beaches. Morning yoga with Kamal with hectars of Nature at your doorstep, homegrown fruits and vegetables, a family style villa with a beautiful outdoor area, rent a bike, indulge in a melting massage, relax on the beach and / or take a walk along the stunning coast, take part in a walking or bike tour, test your cooking skills with a cooking lesson, visit the nearby historical towns, sip on some local wine accompanied by local cheese or just read and have a nap in a hammock. It’s your retreat. It’s your gift to yourself, put a spring intp your step with this long weekend treat!! 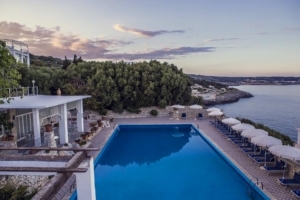 Piccolo Mondo is a beautiful, simply stunning, breathtaking sea view hotel in Castro. Join us for this long weekend sea break. Daily morning (sunset upon request) and late afternoon sea view yoga with Kamal, delicious home cooked meals, excursions to visit the sites, free time to relax by the sea water pool bar or by the sea, indulge in a melting massage, play tennis and bowls or take a walk along the picturesque coast and visit the local town. Let yourself be enchanted by the sea as you relax, rewind and just be. For more info go to the Piccolo Mondo Website and send them a mail! Join us for these -2 beautiful long weekends. 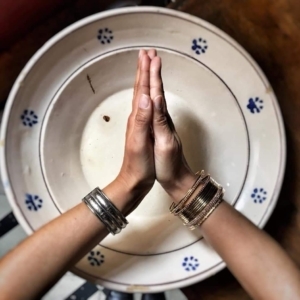 Your teachers are Anne Julie born in France also with Salentini roots, now based in Paris, instructor of Vinyasa flow and Kamal, born in the UK, with Indian origins now based in Salento, Hatha Yoga teacher. Together we will flow, recharge and relax with you with daily morning and evening pratices, a mix of Vinyasa, Hatha, Yin & Nidra. We will focus on reconnecting with mother nature, finding your ‘fire and nectar’ balance and giving oursleves the gift of living in the present. Take the opportunity to relax, strengthen and challenge your yoga practice, reflect and awaken your inner light. For info follow the link. We are excited and honoured to start this new collaboration with Puglia’s most renowned cooking school “The Awaiting Table”. Join us to discover a lifestyle balance by combining yoga and the Mediterranean diet, two methods towards the same goal without imposing too many restrictions. Daily morning Hatha yoga (and optional afternoon yoga) with Kamal, after a beautiful breakfast, lunch and rest/outing we’ll gather around the chalkboard to talk about and taste wine, learn about the history, culture and cuisine of the Salento kitchen, learn the importance of the Mediterranean diet and then head into the kitchen to prepare our evening meal. All this will be set in a stunning Castle in the heart of Salento. For info follow the link. 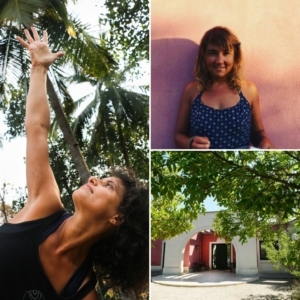 Our Salento Yoga family are a vibrant mix of international yoga teachers, and organisers with Italian and Indian backgrounds – each of us dedicated to providing you with an authentic Italian experience. We will take care of your every need, so all you need to worry about is allowing yourself to completely relax and let go. We promise you that you’ll leave feeling revitalised, energised and inspired on every level and wanting to come back for more! Flow with our trained International yoga teachers. Our wonderful teachers will run week retreats and weekend relax workshops. Experienced Chef with years of experience. Creating dishes using only the fruits and vegetables in season. Our Salento Yoga Organizers will take care of your every need to make sure you have an unforgettable holiday. Surround yourself by the magic of this beautiful Southern Italian peninsula, Salento. A dedicated team, wonderful food, expert yoga training, stunning beaches and nature at your doorstep. Let Salento Yoga bring the magic in your life! Still deciding where to host your next retreat? Maybe we can help…contact the team now and together we can build your perfect retreat!! Salento Yoga 2013 in one of the best things I have ever done! Absolute paradise! (and I cannot believe you made me a Birthday Cake with my face on it..haha) Thank you so much!! This week has been amazing and I have been inspired so much by the beautiful location, our incredible teacher Kirsty who (probably without realising) has helped transform my life since the first class I attended, my fellow yogis who I have had the pleasure of sharing this experience with & finally Kamal, Alessio, Valentina & GianFranco who could not have done anymore to make our time extra special & are some of the kindest people I have ever met. See you all next year for more sea, sun, yoga love, laughs & of course Valentines food!! Quick decisions are often the good decisions! and especially if you find your way to SALENTO YOGA! Highly recommended week. You will be in good warm caring hands of this Salento Team. Then the beautiful Villa Paola, the sea, GianFrancos famous “Baileys” – who wouldn’t like to celebrate his/her birthday here?? Just what is needed from a yoga retreat. The teaching was insightful and informative with care and integrity; the atmosphere at the villa peaceful and conductive to socializing or solitary time as desired; the organization sensitive and discreet; and the food sublime! I came to recharge my batteries but discovered, almost without knowing how, that I’d recharged my soul. Thank you for a truly memorable week. Mmmmmmmm!!! What can i say? This was an amazing retreat. I have been on a few retreats but this by far has been the best. How lucky were we to have experienced so much of Southern Italy. I know the yoga has improved & I will continue, promise when I return to Bellagio. A big thank you to Kamal, Kirsty, Alessio, Valentina, Gianfranco & Paola. You went out of your way to make the week very special. Ciao and see you next time. To Our Salento Family, Thank you so much for such a wonderful week. We will never forget our first time here. Looking forward to many many more. The entire week has simply been GREAT!!! I was so excited about coming on my first yoga retreat and it has exceeded all my expectations. Kamal, Alessio and Kirsty have brought us all together into a beautiful yoga family. The yoga, atmosphere, activities, love, laughter, jokes, tree climbing, gelato, food, food and more food have been PERFECTO! The experience of the week is more than just this week, it has changed my life!!! It was a total experience to be hosted by you at Castro, September 2013. You thought about every detail and took care of every moment of our yoga vacation. I hope that your natural hospitality will meet the same hospitality when you have your own vacations around the world. We named it the pirate beach, for the skull and crossbones flag. The captain, aka bar owner, had departed for the season, leaving behind his wooden decking, perfect for our evening yoga. 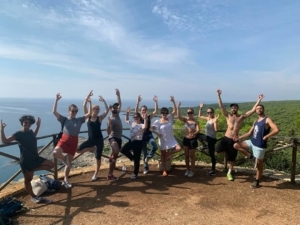 As the sun set over Puglia’s unspoilt west coast, we stretched our bodies/soothed our minds, gently guided by Scottish instructor Eileen Jackson and local teacher and retreat organiser Kamal Fanibanda, the sea swirling beneath. Morning sessions found us on the villa’s roof terrace, looking down on pomegranate trees, exploring new challenges in thoughtful flow sessions. We managed dinner in Gallipoli, lunch in Lecce, beach trips and cycling, but it was yoga in the open air, friendship and fab local food that made us come back new. I totally loved it…as well as Kamal’s amazing yoga classes – she is so positive and inspiring there were fabulous excursions and nothing was too much trouble! Giulia’s hospitality was wonderful and The Aia is perfectly located not far from the beautiful Puglian beaches and the lovely town of Nardo. We ate delicious food including many of the local delicacies, learned how to make pasta, visits to beautiful Italian medieval towns and a fantiastic boat trip when we watched the beautiful Salento sunset. Yes, all in one week. I have returned energised for a Scottish winter and can’t wait to return to meep up with my new friends again. Thank you so so much and Namaste. GRAZIEEEEEEEEE!!!!!! KAMAL e GIULIA per una bellissima settimana da voi in Salento in mezzo le olive in pieno natura. Mi sono trovata benissimo, siete meravigliosi. Grazie per un super programma – Superyoga, super tuttooooooooooo!!!! TORNEROOOOOOO!!!! BACI a voi e la belissima Puglia.